The only thing that compares to the adventure of leaving home is the sweetness of coming back to it. My summer vacation has finally come to a close. 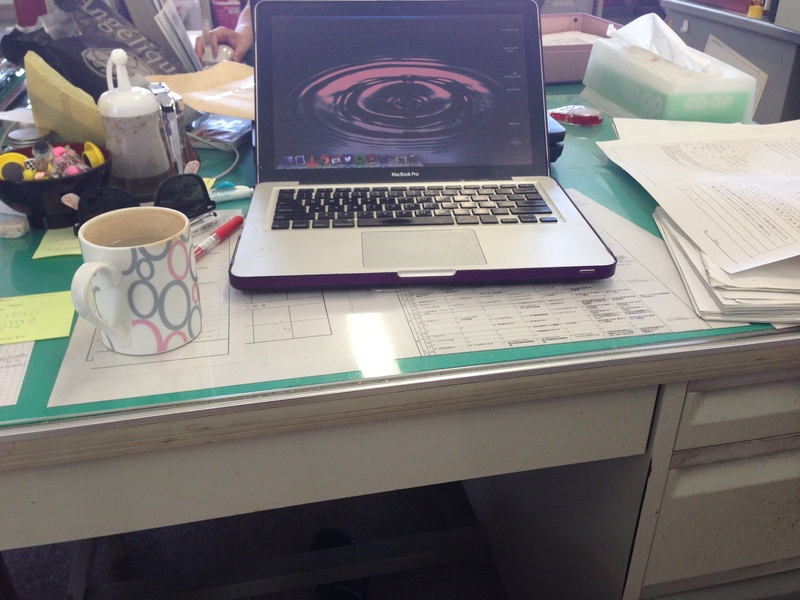 After spending the past three weeks cavorting around Turkey, I’m back at my desk at Aomori High School, surrounded by exams to grade, lessons to plan, and grad school enrolment (!) to complete. And oh, how good it feels to be home again. …but for now, I’m just happy to be home. Anyone who’s left home for any substantial chunk of time knows how much of a relief it is to come back again. 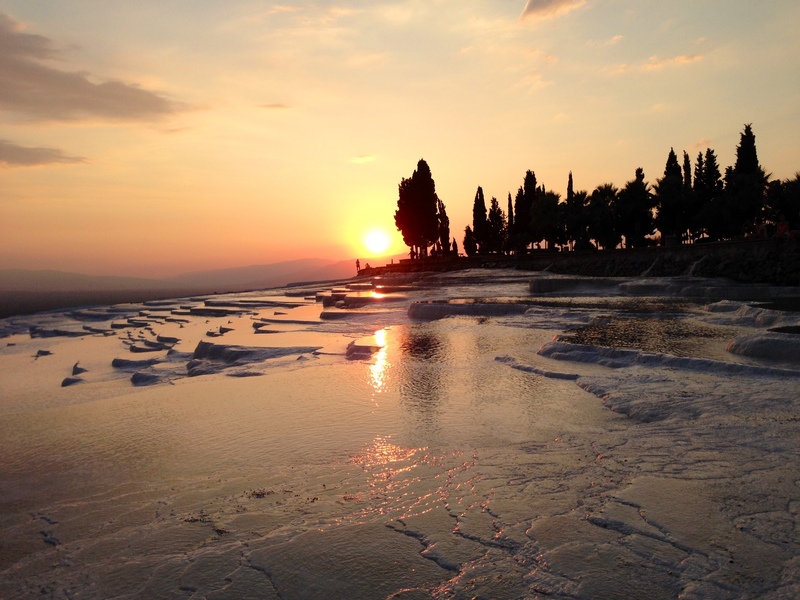 Last night, when I staggered through my shabby, cozy apartment’s front door, weighted down by a backpack substantially heavier than when I left, I think that I was just as happy as I had been when watching the sun rise over the otherworldly rock formations in Cappadocia a few weeks prior. Adventures abroad are all good and fun, don’t get me wrong. I know that I’m ridiculously lucky in the life that I’ve ended up with, but I love both sides of that life; I love the comfort and contentedness I feel at home as much as the foreign adventures I enjoy away from it. My feet love to tread over as much new ground as possible, but after a while, I can’t help but crave familiar surroundings and the routine that I left behind. After a few weeks of changing hotels every night or two, the only bed I want to sleep in is my own. After a few weeks of eating out for every meal (delicious though they all were), the only food I want is what’s been made in my kitchen with my own hands. After a few weeks filled with a go, go, go! mentality, all I want to do is stop, sleep, and watch the new episode of Doctor Who. In my soul, there reside both an ambitious dromomaniac and a Netflix-worshiping homebody. Too much time spent patronizing one means that the other rears its head with a needy vengeance. For now, the hermit side wins out. At approximately 5:32 this morning, my upstairs neighbors may have been awakened by the sound of me screaming in exulted bloody murder. There wasn’t an intruder lurking over me and I didn’t squash a spider underfoot on the way to the bathroom or anything so sinister like that…no, I was whooping because Miroslav Klose, striker extraordinaire and all-around powerhouse, found the back of the net for an equalizing goal in the seventy-first minute of Germany’s match against Ghana. Also, that infographic might be my favorite thing ever. Admittedly, I fall into that group of Americans whose passion and enthusiasm for soccer spikes exponentially during the World Cup. I love soccer, don’t get me wrong (I wouldn’t be writing this if I didn’t), but aside from casually following Bayern München and Lazio (the Italian team Klose plays for), I confess that I don’t follow it slavishly for much of the year. A lot of that has to do with the fact that I just don’t have convenient access. Japan’s not exactly known for its soccer scene; if I were based in Europe or South America, I think it’d be a whole different story. We’ll see how that changes, depending on where I end up after Japan. When the World Cup comes around though, it’s soccer 24/7 for me. But why, as an American born and bred, was I so amped up over a German goal? Here’s the thing: I may be an American, but when it comes to the World Cup, Germany, not the good ol’ US of A, is my team. I wasn’t always this way. In fact, up through most of my teenage years, I couldn’t have cared less about soccer in the first place. Both of my younger sisters played, and whenever I got dragged along to games or practices, I more than likely spent the time with my nose buried in a book, rarely glancing up to watch the action on the field. (For the record, now that’s changed mightily…I follow baby sister Mani – university superstar, accolade magnet, and nationally ranked player that she is – like a rabid fan, refreshing game stats every two minutes when she’s playing while I’m at work.) And no matter how many times it was explained to me, I never understood what ‘offsides’ meant. That changed – or at least, the seeds of change were planted – in the summer of 2006, when I went to Germany for the first time. In 2006, Germany hosted the World Cup…and that week opened up my eyes. Before that, the World Cup wasn’t even a blip on my radar. But when I was walking through Berlin at eight in the morning and saw thousands of people – in German colors and otherwise – reveling on the street in jerseys and painted faces, I had an epiphany. Somewhere at home in America, that scarf is buried amongst my belongings. In 2009, when I studied abroad in Germany, my conversion was complete. Köln, the city where I lived, was home to one of the worst teams in the league – 1 FC Köln – but that didn’t matter. 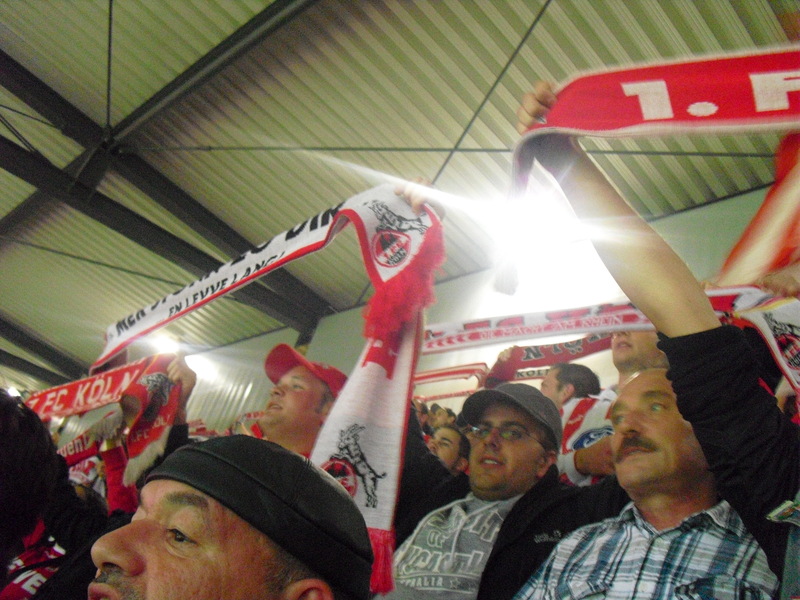 One of my favorite memories of the time I spent in Germany was at a home match. I don’t even remember who the opposing team was – Dortmund, maybe? – but I remember being crammed into a subway car like a sardine with the rest of the fans, I remember sipping a Colabier on the grounds before the match started, and I remember shouting Tooooor! 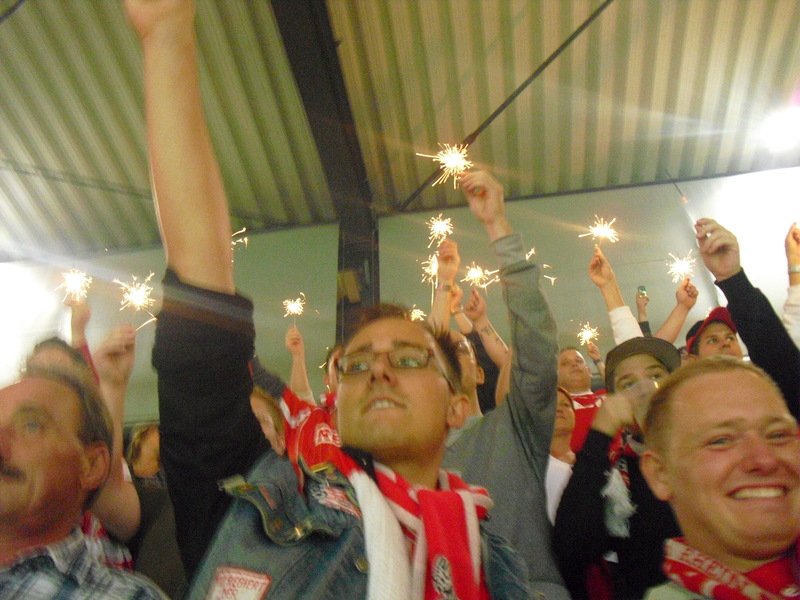 along with the Germans in the seats beside us every time Köln scored a goal. Sparklers aloft. Funnily enough, I think this was one of the few games Köln won that season. Without question, it was more fun than any American sporting event I’d ever attended or watched. And I was more invested in that one game, as meaningless as it was in the long run, than I ever was in any Super Bowl that the Steelers, Pittsburgh’s (American) football team, played in. 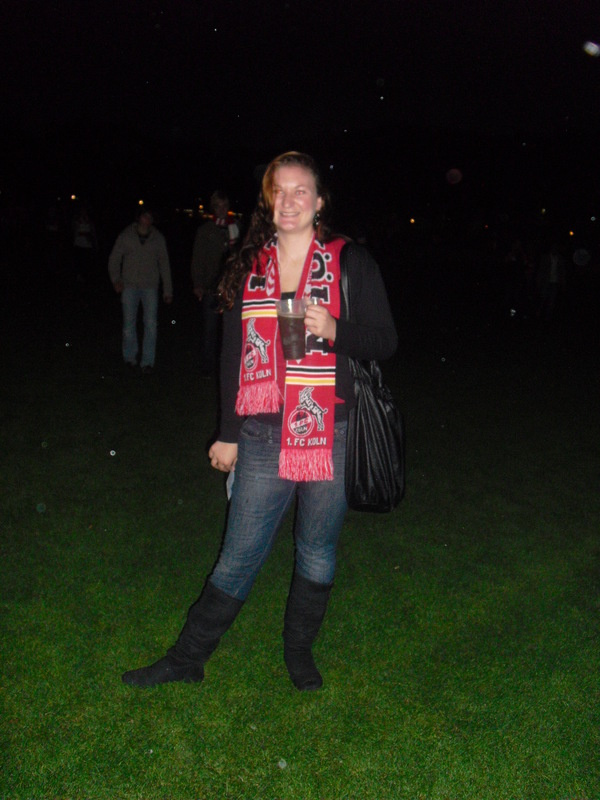 In 2010, when South Africa hosted the Cup, I bled gold, red, and black for Germany. I watched all the matches (shout out to my boss for being one hundred percent okay with me watching games while at work), cheering, fretting, and biting my nails through every one. The names of the German team – like Khedira, Podolski (who, incidentally, played for Köln at the time! ), Ozil, Gómez, Neuer, Müller, Schweinsteiger, Lahm, Boateng, and most of all Klose – were burned into my brain. And now, in 2014, I’m waking up at all ungodly hours of the night to watch Germany’s games, hunched in front of my TV or over my iPad, freaking out when my stream lags or skips. A good portion of my love for the German squad obviously comes from the team itself. From Cup to Cup, the German teams are often described as young, but they certainly don’t play like it. Like so many of things of German origin, they are quick and efficient on the field. They may not play the flashiest game, but damned if they don’t get the job done. And as people? They just seem like awesome, regular guys. There is no German Ronaldo, known just as much (or even more so) for his looks as his talent. There is no German Rooney, with a snobby, superstar reputation off the field. There is no German Messi, whose own country isn’t so fond of him. In fact, there’s no real superstar that stands above the rest of the team. They’re just all damned good footballers. Even Klose, probably the best-known player on the squad, doesn’t showboat or garner attention with anything that isn’t soccer related. I started this post by writing about my guy Miroslav, and there’s a reason for that. I’ve never been someone to look up to athletes as a major role model or inspiration. Miroslav Klose is the exception to that role. He’s stuck around for four World Cups and, with that goal against Ghana, is now tied with – and poised to overtake – Brazilian legend Ronaldo’s record of World Cup goals. It’s not just his talent that I love. In a sport that’s often ridiculed and criticized for its athletes diving or playing up injuries, Klose is a good guy. He plays it straight. And seeing as this will be his final World Cup appearance, I want him to go out on top. When I tell other Americans that I cheer for Germany, I get a lot of negative reactions, at least from people who don’t know me well. Surprise usually comes first, followed swiftly by “You cheer against your own country?” The way I see it, I don’t cheer against the USA. I want them to advance past the group stage, and if they made it out of the “Group of Death” alongside Germany, all the better. And, honestly, considering most Americans don’t even care about the World Cup, I don’t feel the least bit guilty supporting Germany. If there’s one stat that sums up America’s view on the Cup, it’s this: of all the teams competing, which team are most USA fans hoping to see lose? Their own team. Later this week, Germany and the USA will play against each other…and I will be cheering for the country that taught me to love the sport of soccer. I’ll cheer for the country that I lived in when I discovered just how great that sport is. 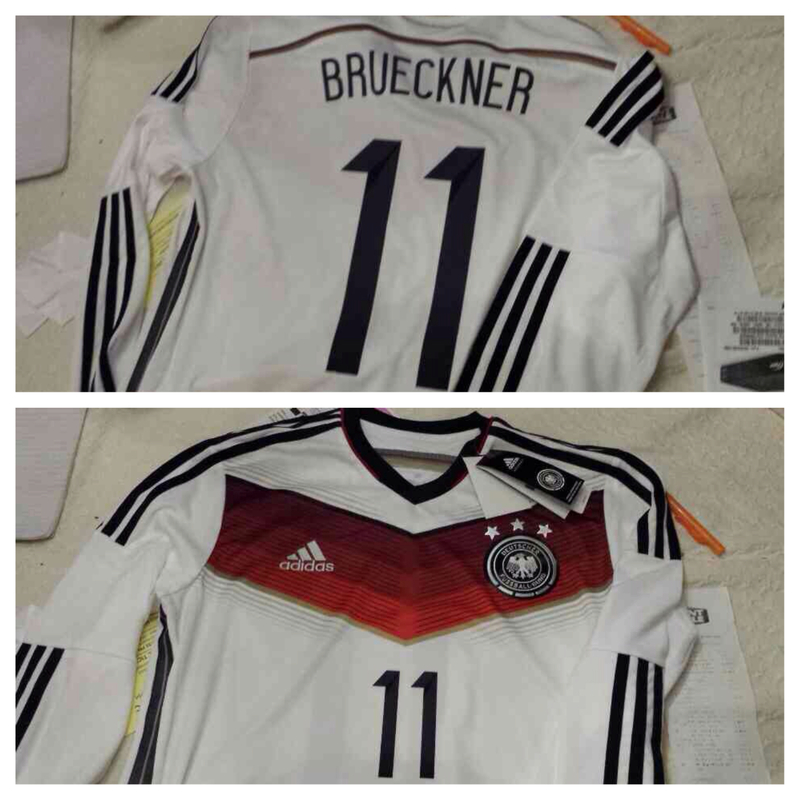 And if by some hellish twist of fate Germany doesn’t advance past the group stage, you’ll be able to find me curled up in my bed, sobbing while wearing my customized German jersey, adorned with the number 11 (Miro’s number, naturally). But I’m willing to bet that Klose and company won’t let that happen. When I wrote this post, the subject of exoticism really stuck in my head. The more I thought about it, the more I realized that I could apply it to travel and how our perceptions, including our opinion of what is and is not exotic, are changed through it. This post was borne out of that thought process; though it shares a few paragraphs with my previous piece on exoticism, the theme and commentary within it is much more travel-centric. It also appears here on Matador Network.